The gate of Dong Van market has been consolidated , like markets at lower delta, but houses, roofs there can not replace the umbrella of ethnic people. In the middle of the market, the Thang Co stalls are located behind food stores. Pork, beef in the market is slanted on the big hook. Wine stores are located closely to the Thang Co Stalls. The wine stored in large plastic cans or jars that the horses have been piggybacking early in the morning or the night before. A world of wine is rich, full of flavor of passion. 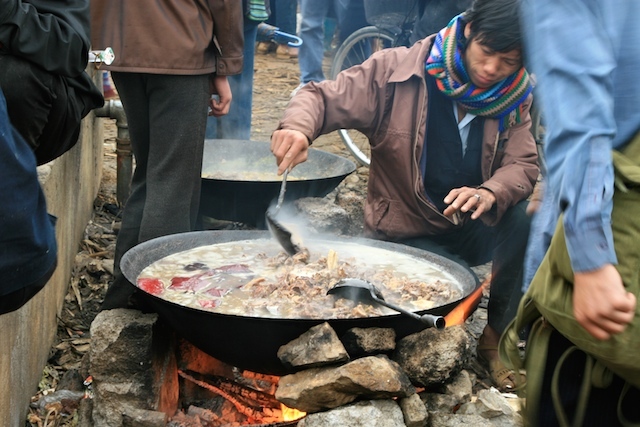 The H'Mong call Thang Co "Khau Tha" which means "meat soup", consistsing of the organs of cattles, buffalos or goats, but the Thang Co of cow is the best. Take the organs and four lower legs of the cow to wash and then cut into square which is equivalent to two knuckles, marinated salt, pepper, lemongrass and boiling water, then put the meat in. Altogether you can enjoy the crispy crust of the meat and the fatty flavours of cattles' organs. At first glance, it doesn't seem to be attractive and appealing to the population. But when you have a sip of corn wine and a hot bowl of smoke between the frosty atmosphere, you defintely fall for this. Thang Co raises the smell of spices andstrikes many travelers when coming to the North. If you have chance to the festivals and markets in the Ha Giang highlands to discover many wonderful things in the region, don't forget to try a unique bowl of Thang Co there!